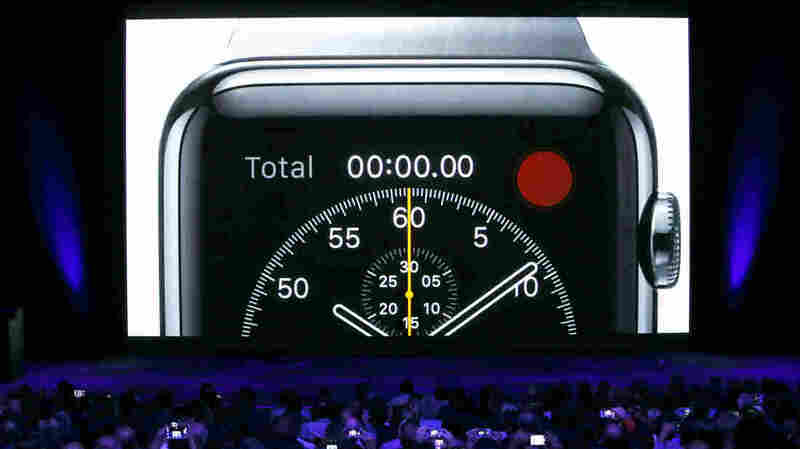 The 2014 Tech Trends We'll Still Be Talking About Next Year : All Tech Considered Apple is ending an influential 2014 but faces another big test ahead. And we revisit the mega-hacks of the year and look to a more voice-controlled future. And just like that, 2014 is coming to a close. We live in fast-moving, hyper-connected times in which it seems technology is driving numerous cultural changes. NPR tech reporters Laura Sydell, Aarti Shahani and I looked back on a few ideas and topics that intrigued us this year but will continue to get attention in the year ahead. The company's stock is near an all-time high, it released larger iPhones to swift sales and Fortune named Apple CEO Tim Cook one of its top people in business, not just for his stewardship of the company but also because he "stole the spotlight by matter-of-factly becoming the first openly gay CEO in the Fortune 500." But some intriguing tests are ahead. Will the just released Apple Pay and the Apple Watch due early next year help the company keep its reputation as an innovator? This year I explored the fast-advancing world of "magical" computing, or devices that know what you need before you ask. My prediction for 2015: We'll get so overloaded by having to use our thumbs for data input that we finally start using our voices to command our devices. Smart virtual personal assistants a la Siri have been a concept as old as Star Trek, but they're finally hearing us better and anticipating our needs in more useful ways. Take for example Amazon's Echo, which debuted just in time for the holidays. It looks like a cylindrical speaker that you can stand up in the middle of your living room. You activate it by voice (you say its name, Alexa) and then get it to add things to your shopping list, do simple arithmetic, conduct basic searches and more. It seemed that there wasn't a week that went by in 2014 without a company getting hacked in one way or another. Not even Goodwill was safe from data breaches. Because the consequences of credit card data breaches don't tend to fall on consumers, a lot of us felt data breach fatigue. So will systemic solutions come in 2015 to prevent these from happening so often — or will the cybersecurity problem grow worse, leading to more dangerous and personal attacks?